I recently took a new job working directly in the city of San Francisco, within the Financial District to be exact. Living in the peninsula 20+ miles away, I’m now taking public transportation to work for about 45 minutes (one way). Compared to the last 10 years of driving, commuting on the train offers a completely different dimension to the day. Furthermore, for a guy like me who loves to observe what’s around me, public transportation is a very fruitful environment for observation. Without further adieu, here are my observations, tips, and lesson’s from a month’s worth of public transportation on the Caltrain, the Muni Light Rail, and occasionally the BART. The observations will be listed in the following categories: Observations, Lessons, Tips and Suggestions, Phones & Technology, and Differences between the BART, Muni, and Caltrain. On the Caltrain, you don’t want to to sit in the last row or near the last row of one of the cars—way too bumpy. After the Caltrain arrives at the last stop at 4th and King in the city, people generally are in a hurry to get up and out of the train to catch the bus or light rail that many people need to get to their ultimate destination. But in this haste people often won’t let people up and into the aisle- it can become a dog eat dog world. My suggestion—don’t be in such a rush that you won’t let someone out of their seat and into the line in front of you- the chances of missing the next train or bus because you let 2 people up in front of you on the train is very slim. Sit by the window on the Cal-train— there’s a lot to see outside and the train actually goes by many industrial areas. We often don’t get to see these types of places—junkyards, warehouses, inventory sitting outside. Great way to add new perspective for the knowledge worker who is the typical Caltrain commuter. Building on that—sit by the window, but try to switch sides of the train frequently. There is something different to see on the other side and you’ll only be actually looking out the window for a small amount of time so you’ll see something new frequently even if you’ve been doing the commute for a long time. While I have run into people while taking the train, generally no one talks on the train. Most people don’t know each other and are focused on their music, phone, reading, people watching, or gazing out the window. It’s quiet. My preconception was that there would be lots of cell phone conversations on the train, particularly since this is a group of business commuters. To my surprise, there really aren’t many phone conversations, and the ones you do hear are generally short. Not many newspapers on the trains—the ones I do see on the Caltrain are more Wall Street Journals than the San Francisco Chronicle. When the sun is out, the ride seems better and the outlook for the day feels better. Obviously a cliche, but true—it’s been raining most of the days in February so looking forward to more consistent sun. People like routines; the same people stand at the same spot on the platform each day waiting for the train. I’ve thought about nudging people out of their routines by getting there first and standing at their spot but decided not to— why should I disrupt what people hold onto as part of their normalcy. The thing that you notice first and foremost is that people are glued to their phones. 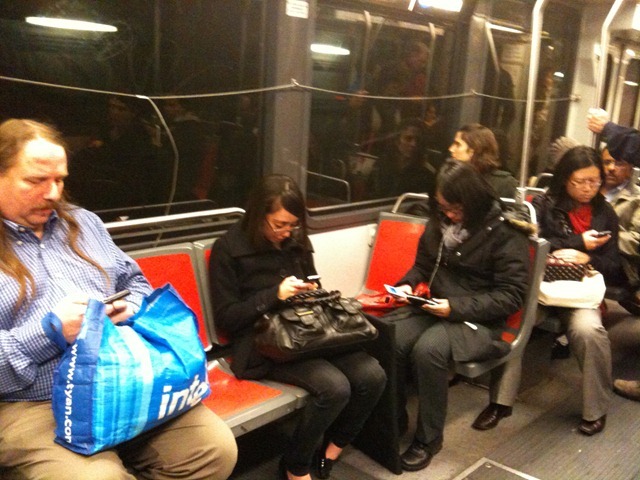 For music, information, books, games, and then maybe talking; the business commuter would be lost without their phones. Very few books and newspapers because folks can read everything on their smartphones. It feels like a very close split between Iphones and Blackberries. On the Muni, more iphones, on the Caltrain, equal amount of iphones and blackberries. There are a handful of people who take out their laptops to do work—I’ve even seen some coding done at times. But often times, it is too crowded to comfortably take out a laptop and work. While netbooks have been one of the bigger selling computing devices, I don’t see many netbooks. Business commuters aren’t using them and they are taking out their Dell and iMac laptops when work is being done. Likewise I don’t see many kindles or e-book readers—of course there is a kindle app on the iphone, not sure how many people are using that kindle version. Apple’s iPad is coming out I believe April 3—I’ll be eagerly observing how many iPad’s i see on the train. One unexpectedly funny thing about the Caltrain ride down the peninsula is seeing the new wi-fi networks and the names of the networks that are being sensed by my iphone every few minutes…some funny network names. Given that the Caltrain is coming from the suburbs and heading to and from downtown SF, you see much more of a business commuter who owns a home and has a certain common income level. Clothes, look and feel of these passengers are much more alike. The Muni light rail on the other hand circles the city—much different cross-section of people on this train. Many more young people who live and work in the city, likely live in apartments and are much more glued to their iphone than the older Caltrain commuter. But on the Muni, you’ll also lower income SF residents, maybe some homeless, along with tourists. Much more diverse. By the way, seeing the cross section of people of a city on the local train is a great way for tourists to get a feel for the true city. A lesson for when visiting other cities – take their public transit to experience daily and more routine life in that city. The Caltrain works on a ticket system of honesty. You buy your monthly, 10 ride, or daily ticket but the conductors only really check tickets 1 out every 5-7 days. But the uncertainty of that one day plus people’s common integrity and I’m sure prevents too many abusers but I’m sure there are those who play the game daily hoping that this won’t be the day that the conductor checks tickets. I’ve only taken the BART two times as it isn’t as close to my home, but my quick observations about the BART are that it is more crowded in the morning and would be much more likely to have to stand on the way home. The BART is underground more often or in tunnels so you lose your signal on your phone much more often than on the Caltrain. For that reason alone, the phone addicted person that I am, I will always prefer the Caltrain over the BART. But you also notice many more newspapers on the BART because of that same reason. Out of 40 rides or so on the Caltain, there have been two significant delays when the Caltrain has either hit a person or a car on the tracks. That’s not a very good rate of accidents—i certainly hope that improves. Of course, these may have been suicide attempts so not much the Caltrain can do about it. Well, that’s one month’s worth of observations on the train. A great place to observe people, technology trends, and human behavior– more updates to come as I spend more time on the train. Very enjoyable read…got this via @murphstahoe. I typically do the reverse but with my bike. Would be interesting to see if you had the same opinions about Caltrain when leaving the city in the a.m. and returning in the p.m. My guess is that it’s a slightly different cross section going the other way. Another option for taking different trains. Try a different stations (Hillsdale) as there are some that stop there, but not at San Mateo.